Hey Rules Guy, is there a safe, proper way to lift a ball so I don't get penalized? Hey Rules Guy, is there a safe, proper way to lift a ball so I don’t get penalized? Two fellow competitors hit balls that landed within inches of one another. Under Rule 22-2, if a player believes another ball might interfere with her play, she may lift but not clean the ball unless it lies on the putting green. 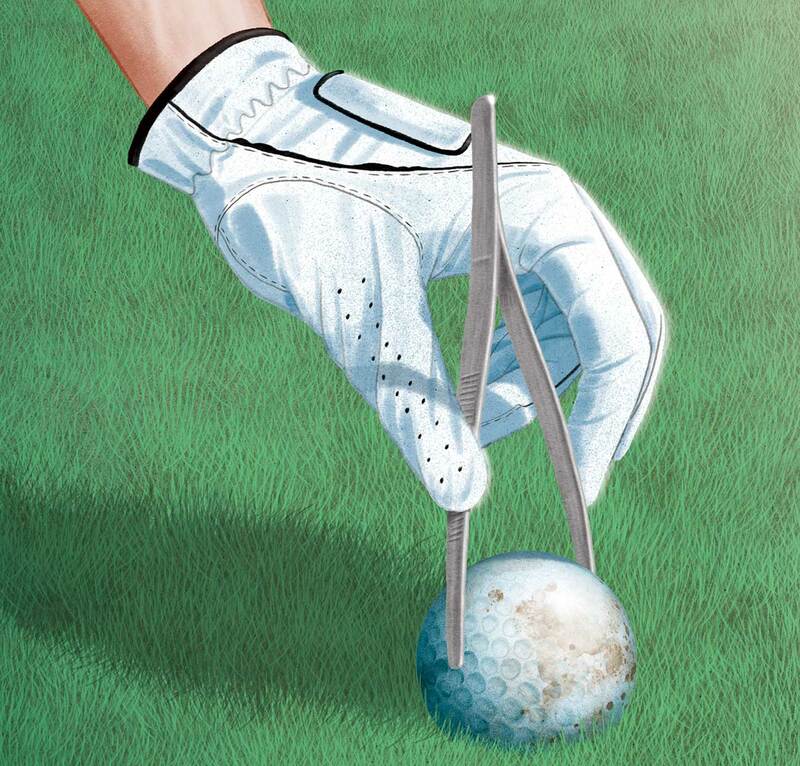 Recently, a player at my club lost a tournament because, after lifting her ball in a fairway under this rule, she put the ball in her pocket until replacing it — and her opponent made a successful claim that this amounted to cleaning the ball. If that’s the case, is there a safe, proper way to lift a ball? —CAROL METZ, GRASS LAKE, MICH.
Rules Guy and Mrs. Rules Guy often disagree on what defines “cleaning”: “You’re neat, I’m clean,” she likes to say. Regardless, in golf terms, cleaning is strictly a question of fact, not intent. Decision 21/3 (which discusses a player tossing a ball to her caddie when it is lifted under the interference rule) is the relevant precedent here. Essentially, the crux of the matter is, did the act result in the ball being cleaned — even just a smidge, even accidentally? If there is any doubt, the matter is resolved against the player, who incurs a one-stroke penalty. So the claim was certainly plausible under the circumstances, even if it might seem like dirty pool. A drive by a player in my foursome landed on a sidehill lie. He took some soft practice swings about four feet down the slope, not thudding the ground or taking divots. Without his noticing, the ball started rolling, and his practice swing sent the ball into the woods, unplayable. Did he make a stroke? Does he take a penalty stroke from where the ball now sits? Does he simply re-create his original lie with no penalty, since he never addressed the ball? Help! —JIM HAGER, RAYTOWN, MO. Help is on the way, Jim. The standard for “Did the player cause the ball to move?” is “more likely than not.” In this case, the player should hope he did. If his actions made the ball move, he hasn’t made a stroke because he didn’t intend to hit the ball. Under Rule 18-2, there is a one-stroke penalty for moving a ball at rest, and the ball is replaced. If instead his actions didn’t cause the ball to move, and wind or gravity is a more likely culprit, then under Rule 19-2 he has accidentally deflected his ball and must play it from its new position with a one-stroke penalty. If he then has to take an unplayable, that’s another one-stroke penalty. Obliviousness has its price. Playing against a lifelong friend, my drive landed on a hard-packed dirt cart path. I took a free drop. Pal-of-mine demurred—he said that if the path were made of concrete or asphalt, I’d be entitled to relief, but not for dirt. I duly replaced the ball on the path, and the golf gods rewarded me with a lovely 5-wood into the green. Still, we both want to know who was right. —DAVE BRIDGEMAN, FORT MYERS, FLA.
With friends like yours, who needs Rules Guy? In fact, what you really need is a contractor, because the relevant question is, Was the path artificially surfaced? That is, if dirt was placed there to create this path, then it is an immovable obstruction and you were entitled to relief. There is no free relief if it’s just a worn-down path created over time by foot and cart traffic. As you can see, the path to Rules enlightenment is long and winding.